Peptide (C)RKAKATRKLRLRPSD, corresponding to amino acid residues 232-246 of mouse MTNR1B (Accession Q8CIQ6). 3rd intracellular loop. Homology Rat - 14 /15 amino acid residues identical. Specificity Unlikely to recognize human samples. 1,2. Anti-Melatonin Receptor 1B (MTNR1B) Antibody (#AMR-032), (1:200). 3,4. Anti-Melatonin Receptor 1B (MTNR1B) Antibody, preincubated with the control peptide antigen. Immunohistochemical staining of perfusion-fixed frozen rat paraventricular nucleus sections using Anti-Melatonin Receptor 1B (MTNR1B) Antibody (#AMR-032), (1:600) and Guinea pig Anti-SCN2A (NaV1.2) Antibody (#AGP-026), (1:2000). A. MT2 staining (red) (arrows). B. The same section labeled for NaV1.2 (green). C. Merge of A and B demonstrates partial co-localization of MT2 and NaV1.2 in the paraventricular nucleus (PVN). For orientation, note location with respect to the third ventricle (3rd V). Cell nuclei were stained with DAPI (blue). Immunohistochemical staining of perfusion-fixed frozen brain sections using Anti-Melatonin Receptor 1B (MTNR1B) Antibody (#AMR-032), (1:600) and Anti-Angiotensin II Receptor Type-2 (extracellular)-ATTO-488 Antibody (#AAR-012-AG), (1:100). A. MT2 staining (red) (arrows). B. The same section labeled for Angiotensin II receptor type-2 (green). 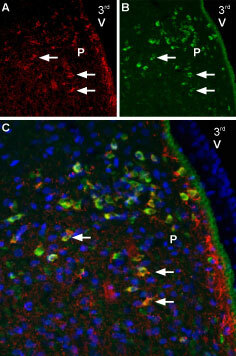 C. Merge of the two images suggests considerable co-localization in the paraventricular nucleus (arrows). For orientation, note localization with respect to 3rd ventricle (3rd V). Immunohistochemical staining of perfusion-fixed frozen brain sections using Anti-Melatonin Receptor 1B (MTNR1B) Antibody (#AMR-032), (1:600), (red). MT2 is expressed discretely in the supraoptic nucleus (SON), adjacent to the optric tract (OT). DAPI is used as the counterstain (blue). Rat dispersed myocytes (Xu, Z. et al. 92019) Eur. J. Pharmacol. 842, 177.). Luchetti, F. et al. (2010) FASEB J. 24, 3603. Zawilska, J.B. et al. (2009) Pharmacol. Rep. 61, 383. Hardeland, R. (2009) Biofactors 35, 183. Altun, A. and Ugur-Altun, B. (2007) Int. J. Clin. Pract. 61, 835. Melatonin (N-acetyl-5-methoxytryptamine) is a product of tryptophan metabolism. It is synthesized in the pineal gland and is secreted to control the circadian rhythm1-3. Melatonin is also synthesized in the gastrointestinal tract, retina, skin and other tissues where it acts in a autocrine or paracrine manner. The role of melatonin in these tissues is independent of its role in the circadian rhythm, where it plays a role in energy metabolism, physiological growth, differentiation and responsiveness in stress stimuli1. The pleiotropic effects of melatonin have given rise to various therapeutic possibilities for this molecule. For example; anti-stress, sexual dysfunction, obesity, gallbladder stones1,4. To date, the only therapeutic uses for melatonin remain to treat sleep disorders, depression, migraine and headaches1. Melatonin exerts its effects through two G-protein coupled receptors (GPCRs); melatonin receptor type 1 and melatonin receptor type 2 (MT1 and MT2). Like all GPCRs, they have seven transmembrane domains and extracellular N-terminal and cytoplasmic C-terminal tails. The binding of melatonin to either receptor activates Gi, thereby activating PLC, thus increasing intracellular Ca2+ levels. Both receptors structurally bind melatonin in the same manner, although MT2 displays a much higher affinity for the hormone. Just like melatonin levels are detected in many tissues, the expression patterns of the two receptors are also quite broad. For example, MT1 is detected in the brain, retina and kidneys and MT2 is expressed in brain and in the retina1. MT1 is involved in sleep regulation and might also have effects on peripheral vasoconstriction. MT2 may play an important physiological role in the retina and might regulate body temperature1. Expression of MT2 in rat retina.Immunohistochemical staining of rat retinal sections using Anti-Melatonin Receptor 1B (MTNR1B) Antibody (#AMR-032). MT2 staining (green) is restricted to the cytoplasm of retinal ganglion cells.Adapted from Sheng, W.L. et al. (2015) PLoS ONE 10, e0117967. with permission of PLoS. Anti-Melatonin Receptor 1B (MTNR1B) Antibody (#AMR-032) is a highly specific antibody directed against an epitope of mouse MT2. The antibody can be used in western blot and immunohistochemistry applications. It has been designed to recognize MT2 from rat and mouse samples. The antibody is unlikely to recognize the receptor in human samples. 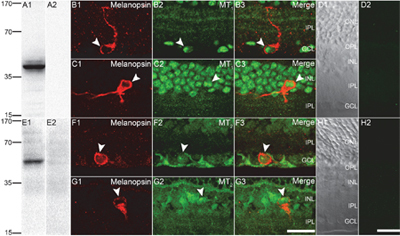 Expression of MT1 and MT2 receptors in rat retina. A1-E2: Western blot analysis of rat retina lysate: A1. Anti-Melatonin Receptor 1A (MTNR1A) Antibody (#AMR-031). A2. Anti-Melatonin Receptor 1A (MTNR1A) Antibody preincubated with the control peptide antigen. E1. Anti-Melatonin Receptor 1B (MTNR1B) Antibody (#AMR-032). E2. Anti-Melatonin Receptor 1B (MTNR1B) Antibody preincubated with the control peptide antigen. B1-H2: Immunohistochemical staining of rat retina sections using Anti-Melatonin Receptor 1A (MTNR1A) Antibody (#AMR-031) (B2, B3, C2, C3) and Anti-Melatonin Receptor 1B (MTNR1B) Antibody (#AMR-032) (F2, F3, G2, G3). 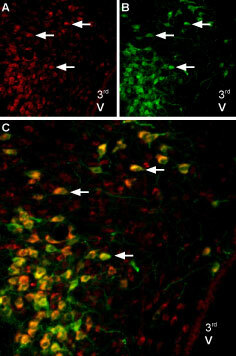 Melatonin receptor expression (green) coincides with that of melanopsin in ipRGCs (red). Note that detection of both receptors is abolished when the antibody is preincubated with the control peptide antigen (panels D2 and H2). Adapted from Sheng, W.L. et al. (2015) with kind permission of Weng, S.J. Institute of Neurobiology, Institutes of Brain Science, State Key Laboratory of Medical Neurobiology and Collaborative Innovation Center for Brain Science, Fudan University, Shanghai, China. Baba, K. et al. (2015) Invest. Ophtalmol. Vis. Sci. 56, 4753. Xu, Z. et al. 92019) Eur. J. Pharmacol. 842, 177.